LADIES LULAC. Ladies LULAC was composed of women's chapters in the League of United Latin American Citizens, the oldest Hispanic civil-rights organization in Texas. Ladies LULAC was founded in 1933 at the statewide annual LULAC convention in Del Rio, when the League "permitted Latin American women to organize on the same basis as men." Ladies LULAC chapters replaced "ladies' auxiliaries," which had functioned since 1932 in San Antonio, Kingsville, and Alice. Joe V. Alamia, a lawyer, and J. M. Canales of Edinburg submitted the resolution establishing Ladies LULAC, but a ladies' auxiliary was already present at the convention. José Luz Saenz served as the first organizer of Ladies LULAC, the only man ever in this position. Alice, Texas, organized the first chapter, probably by incorporating the existing ladies' auxiliary there. In the 1930s Ladies LULAC complimented the work of women in the Spanish-Speaking Parent-Teachers Association, which LULAC men sometimes organized. The Ladies LULAC structure approximated the officer structure of the men's councils, though the secretive rituals at men's meetings in the early years may not have been duplicated by women. Unlike men in LULAC, women sometimes held meetings in members' homes. Ester Machuca becomes Ladies Organizer General. Courtesy of the University of Texas at Austin. Image available on the Internet and included in accordance with Title 17 U.S.C. Section 107. Ladies LULAC became national but remained strongest in Texas. In 1933 LULAC established the position "ladies organizer general," the official organizer of women's chapters, which existed at least until 1942 but was not revived after World War II. Texans occupying this position included Estefana Valdez (1934–35, Mission); Gladstone Swain (1936–38, San Antonio); and Ester Machuca (1938–39, El Paso). Della Hernández (San Antonio) served as special organizer (1938–39) and special organizer-at-large (1939–40). Members were required to be United States citizens until 1986, when resident noncitizens were admitted. Only women joined these groups until the mid-1980s, when men-only organizations were attacked as discriminatory. Ladies LULAC Council 26 in Corpus Christi, for instance, let men join in the 1980s. 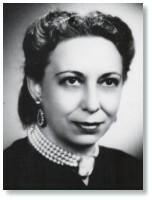 Alice Dickerson Montemayor, member of Ladies LULAC. Image available on the Internet and included in accordance with Title 17 U.S.C. Section 107. Since the 1930s members have represented the Mexican-American middle class. They have usually had high school diplomas, and some have had college degrees. Dalinda Rodríguez of Harlingen and Estefana Valdez of Mission were members with college degrees in the 1930s. In that decade teachers joined, and since the 1970s a small sector of professionals has participated. Both unmarried and married women (sometimes married to LULAC members) became members. In the 1930s in Houston mother and daughter teams participated, and over the years the age of members ranged from twenty-one to over sixty-five. Outstanding members have included Alice Dickerson Montemayor of Laredo; Ester Machuca, Lucy Acosta, and Belen Robles of El Paso; Mary Ortiz of San Antonio; Consuelo Mendez of Austin; and Amada Valdez of Ladies LULAC No. 9 in El Paso. Ladies LULAC was at its height in the pre-World War II years. Eighteen member organizations met in Texas in 1940. The number dropped to three by 1947, but there were sixteen in 1959. Councils could be found in both rural and urban Texas, but only the urban chapters generally persisted. By 1970 the majority of women joined integrated councils, although Ladies LULAC councils continued. Membership in individual councils ranged from ten to thirty. Ladies LULAC Council Document, 1952. Courtesy of the Portal to Texas History. Image available on the Internet and included in accordance with Title 17 U.S.C. Section 107. LULAC News Article featuring Ladies of LULAC, from the El Paso June 1964 Edition. Courtesy of the Portal to Texas History. Image available on the Internet and included in accordance with Title 17 U.S.C. Section 107. Ladies LULAC chapters largely worked independently of one another and apart from men's councils. They were especially concerned with children, the poor, the elderly, women, and politics. In 1934 the Goliad council fought for admission of Mexican-descent students into the public schools. Ladies LULAC chapters were the first to establish Junior LULAC councils for young people. Ladies LULAC contributed funds for the Delgado v. Bastrop Independent School District lawsuit in 1948. In the 1950s women collected poll taxes, registered voters, and bought eyeglasses for school children in Houston. Lucy Acosta and her El Paso council organized Project Amistad, a protective-service program for the elderly, funded by the Texas Department of Human Services. In 1987 the McAllen chapter opened the LULAC Information and Referral Center, which helped Hispanic immigrants establish residency and assisted others with job referrals and other needs. Scholarships have been a major endeavor. Ladies LULAC cooperated with men's councils in such joint projects as the conventions, the 1954 twenty-fifth anniversary issue of the official monthly LULAC News, and major fund-raisers like La Feria de las Flores in Corpus Christi. In 1936 the El Paso Council No. 9 disbanded when male LULAC leaders at the state level ignored their correspondence. By 1990 a woman, Dolores Adame Guerrero, had been elected as Texas state director of LULAC. In that year El Paso Ladies LULAC No. 9 was the only council that had existed since the 1930s. In 1990 the McAllen chapter was the only women's council in the Rio Grande valley, and fewer than ten Ladies LULAC chapters existed in Texas. Arnoldo De León, Ethnicity in the Sunbelt: A History of Mexican-Americans in Houston (University of Houston Mexican American Studies Program, 1989). Moises Sandoval, Our Legacy: The First Fifty Years (Washington: LULAC, 1979). Handbook of Texas Online, Cynthia E. Orozco, "LADIES LULAC," accessed April 25, 2019, http://www.tshaonline.org/handbook/online/articles/wel06. Uploaded on June 15, 2010. Modified on April 20, 2017. Published by the Texas State Historical Association.